Arms: Or three boars' heads erased Gules, armed Proper and langued Azure. 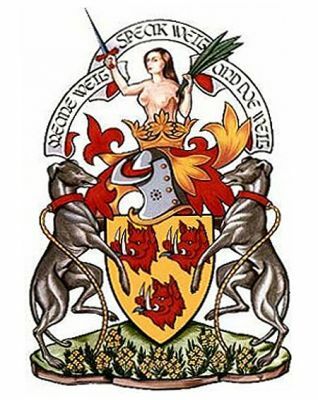 Crest: A naked woman from the waist upwards Proper brandishing in her dexter hand a sword Azure hilted and pommelled Gules and holding in her sinister hand a palm sapling Vert. Supporters: On a compartment below the shield embellished with wallflower having four petals of yellow, two greyhounds Proper, collared Gules with leashes reflexed over their backs Or. Badge: A mermaid Proper tail part Gules crined Or and holding a harp also Or.